Many bacteria surround themselves with a protective coat, to resist attack from antibiotics, predators, and the immune system. In gram-negative bacteria like Escherichia coli, this protective coat is built primarily of lipopolysaccharides (shown here from PDB entry 1fcp), hybrid molecules with a complex carbohydrate anchored to the cell membrane with an array of lipids. These lipopolysaccharides cover roughly 3/4 of the surface of the cell and are the major barrier between the bacterium and its environment. They are also one of the major molecules recognized by our immune system: we have a dedicated system of Toll-like receptors that sense picomolar amounts of lipopolysaccharides, and mount an immediate defensive response. Lipopolysaccharides are built in many steps, constructing a "Lipid A" core, composed of several lipid chains attached to a few sugars, and attaching a variety of carbohydrates to it, depending on the particular strain of the bacterium. The protein shown here, solved by NESG, is thought to be involved in delivery of the lipid chains to enzymes that construct the core. 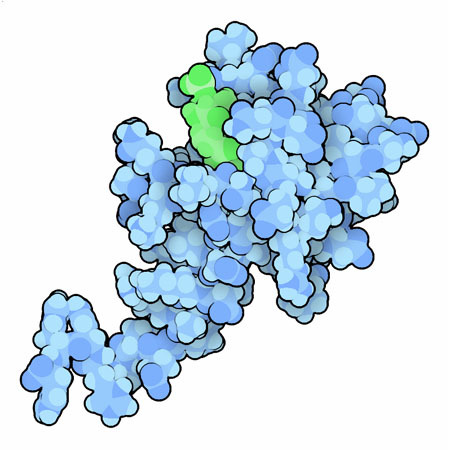 It is an acyl-carrier protein (ACP), which has a covalently-attached cofactor (shown in green) that holds lipid chains (PDB entry 2kwm). Many bacteria have a single ACP that performs all of their lipid-carrying tasks. The ACP shown here, however, is a specialized protein that may play a role in delivering unusual lipids to the odd lipopolysaccharides made by the bacterium Geobacter metallireducens. Geobacter metallireducens is one of the few bacteria that can reduce insoluble metal oxides, turning them into soluble salts. For this reason, it is being explored as a biological agent for cleaning up sites that are poisoned by toxic metals, and PSI researchers have chosen it as one of their targets, to help understand the molecular basis of its unusual abilities. Lipopolysaccharides may play a role in the bioremediation: they are important for attaching the bacterium to minerals, and may also bind to individual metal ions. The Geobacter ACP is similar to the more typical ACP made by other bacteria. They all have a deep hydrophobic pocket that holds the attached lipid while it is transported from one enzyme to another. 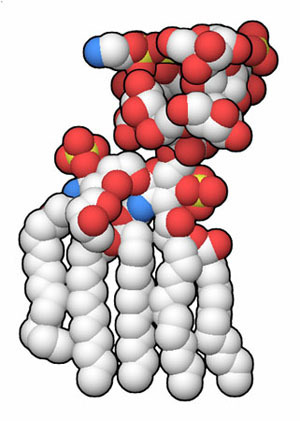 Then, the lipid flips out of the binding pocket and inserts into the enzyme's active site. Three structures available in the PDB capture several steps in this process. The Geobacter structure (PDB entry 2kwm) shows ACP before a lipid is bound. PDB entry 2fad is the ACP from E. coli with a short 7-carbon lipid bound. 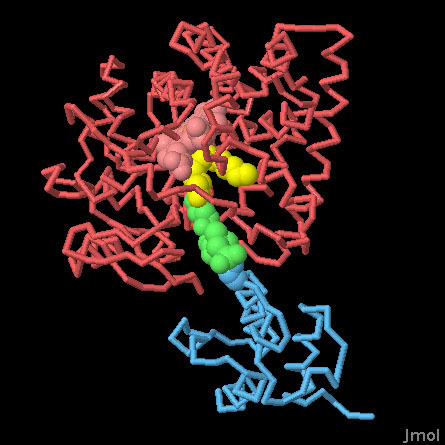 In PDB entry 3ejb (shown here), E. coli ACP (blue) is delivering a longer lipid (yellow) to an enzyme that makes biotin (red). The JSmol tab below displays an interactive JSmol that shows all three of these structures. Three structures of acyl-carrier proteins are overlapped in this Jmol: one before lipid is bound (PDB entry 2kwm), one with a small lipid bound (PDB entry 2fad), and one that is delivering the lipid to an enzyme (PDB entry 3ejb). In each case, acyl-carrier protein is shown in blue with the pantetheine cofactor in green, the lipid is in yellow, and the enzyme is in red. Use the buttons to switch between the three structures, and to change the representation. Ramelot, T. A. et al. Solution structure of 4'-phosphopantetheine - GmACP3 from Geobacter metallireducens: a specialized acyl-carrier protein with atypical structural features and a putative role in lipopolysaccharide biosynthesis. Biochemistry 50, 1442-1453 (2011). Raetz, C. R. H. & Whitfield, C. Lipopolysaccharide endotoxins. Annual Review of Biochemistry 71, 635-700 (2002). Mahadevan, R., Palsson, B. O. & Lovley, D. R. In situ to in silico and back: elucidating the physiology and ecology of Geobacter spp. using genome-scale modelling. Nature Reviews Microbiology 9, 39-50 (2011). Barkleit, A. Foerstendorf, H., Li, B., Rossberg, A., Moll, H. & Bernhard, G. Coordination of uranium(VI) with functional groups of bacterial lipopolysaccharide studied by EXAFS and FT-IR spectroscopy. Dalton Transactions 40, 9868-9876 (2011).